Finally. And if you take in the time change its been 21 months almost to the hour of when we first got the call and saw Edric JoonSoo’s face for the first time. And now he is in my arms. Actually literally, He has wrapped himself into my arms and is snuggled in. We got in late last night and crashed quickly in our bed. Which is not soft. At all. But we were so tired we didn’t seem to mind. At least until 4AM for me when i was wide awake. Clint was able to sleep until about 6. We got around and got our workout clothes on and headed down to the river for a walk/jog. It is not nearly as muggy here this month as it was last month which was a much welcomed change. We grabbed some breakfast at a little bakery and picked up some milk and juice and fruit for the next couple of days. We came back to our room and still had hours to go until custody. We called and talked with my parents and the boys and dragged our feet through our showers and getting ready. Even with taking a super long shower and taking my time getting ready I still had 45 minutes before we had planned on leaving. Finally with butterflies in both of our stomachs we started out towards the agency. Edric JoonSoo was already there with foster mom and when he saw us he jumped into foster mom’s arms and buried his head in her shoulder. When he would look up at us he would wave good-bye. He cried if we came near. We fully expected this. It was odd though because there was another family there and their little one was running around and playing with them. We had some paperwork to fill out which we did while Edric played in the other room with foster mom. We learned that foster dad was there too but he stayed out in the car while we did all the paper work. Later when we did meet him it was obvious what a hard time he was having and I think he was trying to keep his distance. Precious lives, our angels, we send away these lives to foreign countries, with scarred memories of their homeland. Please forgive our sins and allow Korea to be a better country, so that we will be adopting children from other countries, instead of us always sending ours away. We send them for care. So please protect these lives and help them lead a happy life in their new homes. Always provide them with grace and intelligence, lead them to live by rules of Jesus Christ, to have luck, to help benefit others, and to return the glory to our Lord. It is our sincere wish that these lives will not forget their home country and the love of the people who took care of them. Father, please remember the foster families who worked hard whether it is favorable or unfavorable conditions to protect these lives, and give them blessings for the benefits they provided with. By your blessings, these adoptive families will be full of love and be under your protection. Now the children are leaving: Please make their way as easy as possible, lead them to the most pleasant life. We went back downstairs and gathered the bag of things that we had and the one foster mom had packed for us and then walked out to the back. Foster Dad had Edric in his arms during this point and the two other families were getting loaded into the van. I gave Foster Mom a big hug and told her thank you. She told me thank you too and I’m not sure what else she told me. We were both crying. Clint gave her a hug as well and then the social workers were motioning for us to get loaded into the van. We crawled in and I was closest to the door. They passed Edric to us and closed the door. He started crying and screaming and it broke my heart. The van then drove around the block and ended up trying to turn on to the main road right next to the agency. Foster Dad was walking around to his car that was parked out front and he saw our van and Edric saw him and he saw Foster Dad. That only increased the screaming and crying. Foster Dad acted like he was going to come over to the van but then stopped and stood there and waved. It felt like we were parked there forever waiting to turn. He cried for a good portion of the van ride. The other two little boys with the other family had calmed down quickly after pulling out of the agency. Edric finally calmed down when he saw some construction trucks. We had to go to the US embassy to get his visa and passport next. 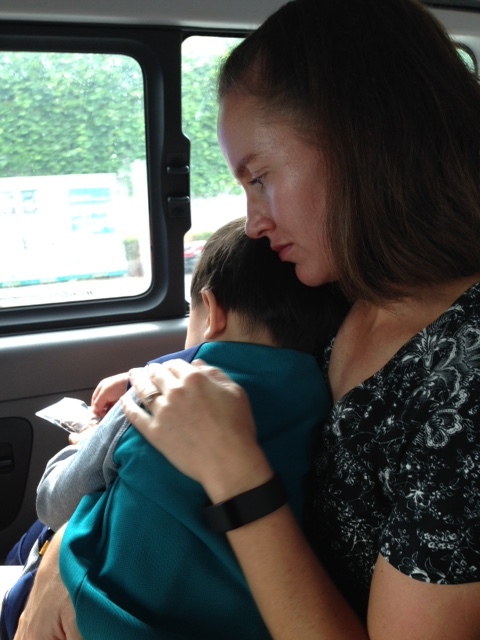 He snuggled into my arms and cried when we got out of the van but calmed down quickly. He initially just snuggled into me at the embassy but then quickly joined the other two boys. They all ran up and down and shared snacks and played. The actual visa interview took all of 2 minutes but then we had to wait about an hour for the paperwork and visa to be completed. We all loaded back into the van then and first went to drop off the other two families because their hotel was close. 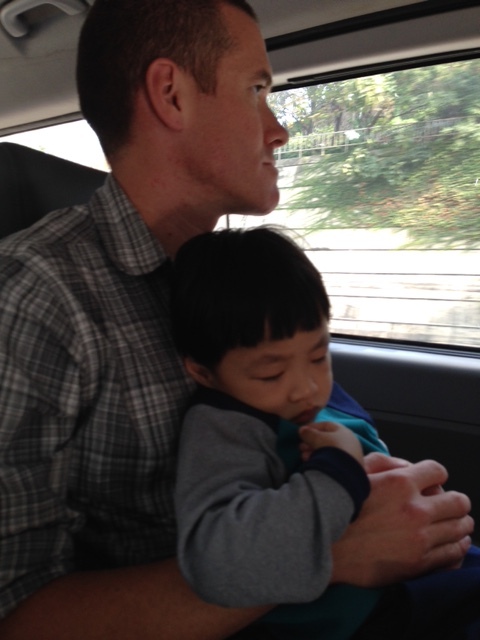 During the first part of that van ride he was very active and going back and forth between Clint and myself, but then after the other families were dropped off, sat in Clint’s lap and before long fell asleep. 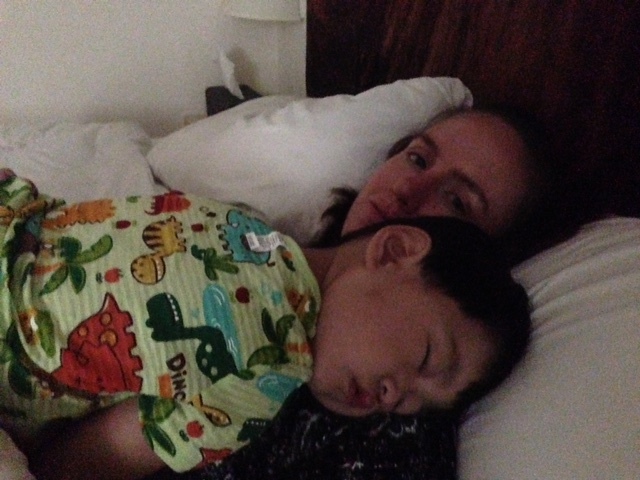 When we got to our room he still looked very sleepy so we changed his diaper and he snuggled into my chest and we laid down and all took a really good nap. When we woke up he looked so depressed and down. He shook his head no with everything we offered him. We looked at the photo books that Foster Mom had sent and just took it easy. When we got ready to go to dinner he perked up a little. I put him in the front carrier which he seemed to really like. We went to the BBQ place for dinner that we had eaten at when we came last month. I tried to order a side of kimchi rice and somehow ended up with a tofu/kimchi/cold soup/something or other but Edric really liked the tofu and cucumbers in it. We ate our dinner. He brightened up and smiled and seemed a little better. However when we got back to our room he refused to leave my arms and just snuggled in. He looks so sad. I think he thought we might be going back to Foster Mom and Foster Dad when we had gone out before. Clint’s giving him a bath now and then we will start getting ready for bed. Not sure how that is going to go, but we are just taking each moment one step at a time. Thankful for everyone’s prayers and support during this and so glad to welcome him into our family.